In today’s tech age, the term “Band” is getting used more and more loosely. DOOMED is Pierre Laube. I suppose DOOMED becomes a band once Laube goes out on tour and hires more guys to play on stage with him. Judging by the website, he hires a small army. The large personnel increase could be the result of DOOMED having a very think and layered sound, which is immediately evident from “Downward”, the album’s first track. A common misstep with Doom Metal recordings is drop everything down so deep and low that all dynamics are lost. Laube escapes this trap by adding a second and sometimes third additional track of high harmony. This also defends the listener from the type of ear fatigue that could come from extremely low notes battering your drums for 40+ minutes. “The Ancient Path” is nine great minutes of doom that is almost quick enough at times to mosh to. At the 7:30 mark you even get some off-beat drumming, which is refreshing since most Doom drummers play so monosyllabic you might even questions if they are actually drummers. “In My Own Abyss” is solid throughout, but the final track is truly beautiful. 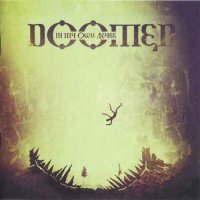 “Oh You, Wilde Steppe” is a truly sorrowful rendition of a Russian Folk song and it is a great way to end a great Doom album. I recommend this album for any fan of Doom Metal.